Ousted Ukrainian President Viktor Yanukovych warned on Tuesday that “dark forces” are working to foment civil war in the troubled former Soviet nation. During a short address in the southern Russian city of Rostov-on-Don, Yanukovych insisted that he not only remains Ukraine’s president, but that he is also still the head of the armed forces. Yanukovych last month fled the Ukrainian capital, Kiev, leaving a power vacuum quickly filled by opposition groups that had for months been protesting a government decision to back away from a proposed deal to bolster economic and political relations with the European Union. The appearance follows persistent reports in Ukrainian media that Yanukovych had died of unspecified causes, speculation that he sought to stamp out in Tuesday’s statement. “I would like to say that I’m alive and I feel good,” he said. 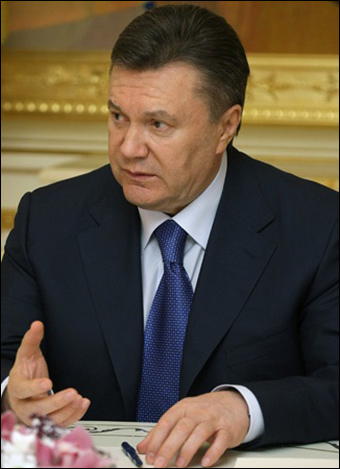 Yanukovych said that a presidential election planned to take place in Ukraine on May 25 would be “absolutely illegitimate,” and that any government formed as a result of the election would be illegal. The exiled leader, who has said he is living with an “old friend” in Rostov-on-Don, criticized the United States for supplying the new government in Kiev with $1 billion of aid that he said even violated domestic US law.